“Meyers Leonard deadass needs an Oscar for this,” wrote one commenter. It turns out the Portland Trail Blazers are theater kids off the court. In a video the team posted on Twitter last week, Damian Lillard and CJ McCollum are shown campaigning for each other to get voted onto the NBA All-Star team. At the start of the short clip, a bagpipe-playing, flaming-throwing Darth Vader rolls by on a unicycle with a "Vote CJ NBA All-Star Sign." When the helmet comes off—surprise, surprise—it's not the Unipiper. It's Blazers point guard Damian Lillard. "What's CJ up to now?" he asks in a phone call to forward Meyers Leonard. "He's dancing!" Leonard replies enthusiastically. "And it's pretty fantastic!" 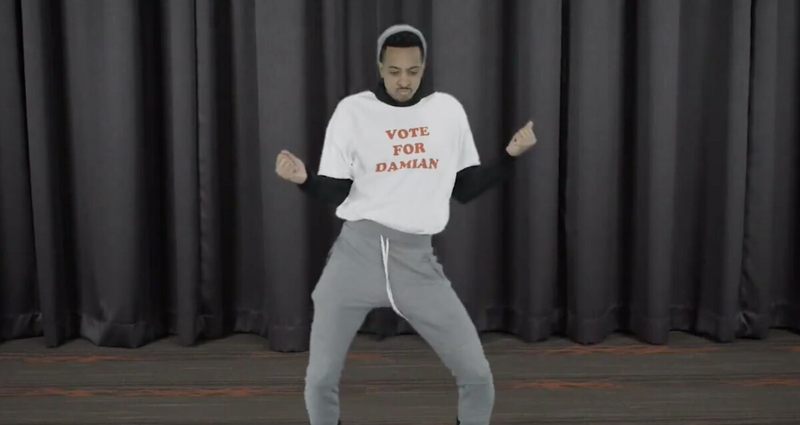 McCollum, clad in a "Vote For Damian" shirt and moon boots shuffles in front of a green screen stage doing the Napoleon Dynamite high school assembly dance. "I never knew it, but CJ McCollum's hips don't lie," one commenter wrote. "Meyers Leonard deadass needs an Oscar for this," wrote another. The comical video is posted on the Trail Blazers' Twitter page with a link to the NBA All-Star team voting website, which is open until Jan. 21. According to returns released yesterday, Lillard is currently sixth among Western Conference guards, with 851,125 votes. .....what are you doing, @CJMcCollum?